Serving you since 2013, this mod is the ultimate builders tool when needing to create spectacular structures. Ordinary blocks like sand, dirt, and planks are used to cover this mod's blocks. Carpenter's blocks mimic whichever block you cover them with, but in entirely new shapes! This allows you to break free from blocks that have static styles and shapes, and to create a truly customized look. 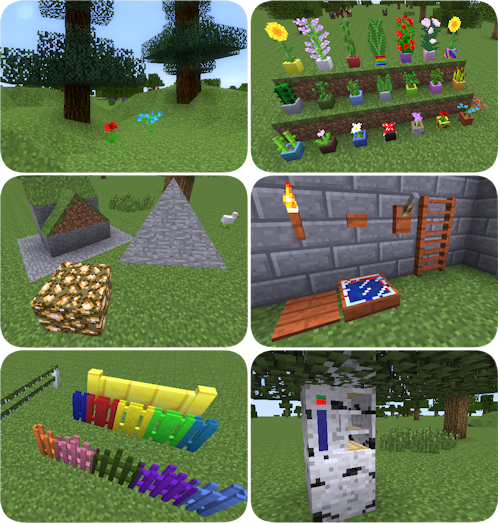 The mod draws inspiration from many sources, including SuperSlopes and Dawn of the Modern World, while also adding unique new features to vanilla blocks you all know and love. An exhaustive list of available options is available in the tutorial section of the official website. 2019...wen will 1.12.2 come out? can you make this for 1.12.2? PLEASE!!!??? For 1.12.2 check out their website - they are working on it YEY! Such a fantastic mod - any chance of a 1.12.2 version? Even if the answer is No I think a lot of players would like to know. Thanks. I realize that Carpenter's Block is in WIP, but this is the way it looks like on my pc. Is this because of being in WIP or is on my side? Hello! Do you know when the new version of Carpenter's Block will be posted for 1.12? I am also keen to have this - brilliant mod but very out of date. I love this mod so much. Please please pleeeease update for 1.12!! please update to 1.11.2 or 1.10.2!? Nice Mod can you update it to 1.10.2.